This time last year Nick and I returned to Kathmandu early and empty handed, literally, after having our base camp robbed and grand old sum of zero climbing. Things went a bit different this year, everything seemed to just work out, great weather, great mountain, brilliant base camp cook, no robbers and a summit. The awesome 1800m North face of Chang Himal (6802m) was quite daunting to wake up to each morning, looking directly across at it, 1km away over a jumbled glacier/moraine mess. Having filled our cook 'Buddy' with confidence after failing to reach the top of some nearby 6000m bumps and taking two attempts to get up the local trekking peak, 'route finding errors...', dawn on the 29th October saw us a good way up the lower part of the face and fighting off the initial signs of a bout of Gardia, perfect timing! 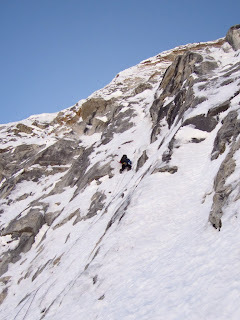 We spent 5 days on the face, covering well over 2000m of ground, the second been the slowest and crux with run out climbing up to Scottish 7/M6 on steep rotten ice/snow over loose rock. Gear and belays seemed to take an age to uncover, finding something if you were lucky. Any un-comfy second night on a 30cm snow ledge was eased slightly hoping the crux section was, hopefully, below us. 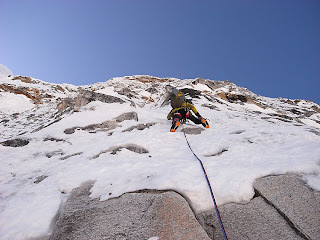 After a few hours simu-climbing the third day ended with 3 pitches bringing us up into the steep Peruvian style snow flutings below the summit. Waking, not sure if we'd climb ourselves into a dead end Nick peeked over into the next fluting returning with a grin, game on! Leaving all the gear at the bivi we managed to grovel up the final flutings to follow the east ridge for the last 100m to the summit. 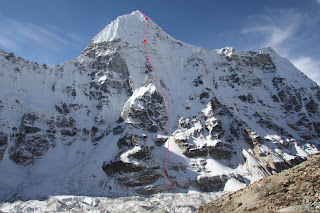 Over a year of looking at photos, nearly two weeks staring, watching from base camp – will it? won’t it? 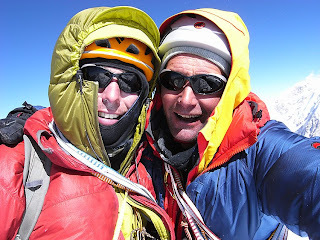 To finally be sat, along with Nick, one leg either side of the knife edge summit, wow! I can’t begin to describe. Down climbing back to the last bivi we spent another night there before abseiling the rest of the face in 14 hours and crashing out in a small cave at the base, bodies trashed but big smiles. A massive thanks to everyone who supported this trip, Mountain Equipment, Black Diamond, Scarpa, Mammut, DMM, SIS (Sports in Science) and the Lyon Equipment Award for their continued help with gear and financial support from The BMC, MEF, Nick Estcourt Award, Mark Clifford Award, Shipton/Tilman Award. This trip couldn’t have happened without it, your support is much appreciated, thank you.